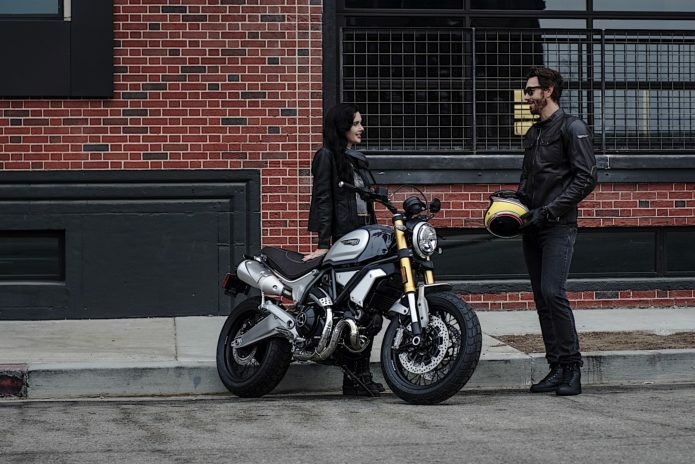 Ducati’s modern Scrambler movement started in 2014 with the launch of the DucatiScrambler Icon (as a model year 2015 machine). Powered by an 803cc L-Twin, the Icon was just a starting point. With the launch of the 400cc Scrambler Sixty2 a year later, an entry-level motorcycle for the don’t-want-to-be-labeled crowd was introduced. Now, the Scrambler 1100 takes the Scrambler line in the opposite direction, placing itself as the flagship of the Scrambler trio. On the engine front, we’ve already established the Scrambler 1100 borrows its engine from the Monster 1100 Evo, but simply plucking from one model and placing it in another is not the case here. In fact, the entire top end of the Desmodue has been redesigned with an all-new twin-spark head. Valves are still actuated desmodromically. The purpose of this, Ducatisays, is to produce a broad and flat torque curve available almost immediately to the rider. In fact, Ducati claims max torque on the 1100 of 65 lb-ft, available at 4,750 rpm, whereas the 800 Scrambler hits its 49 lb-ft peak at a comparatively lofty 7,750 rpm. Max power for the 1100 is a claimed 86 hp at 7500 rpm. Sitting in between the cylinders is now a single 55mm throttle body (instead of two on the Monster), with ride-by-wire throttle actuation.